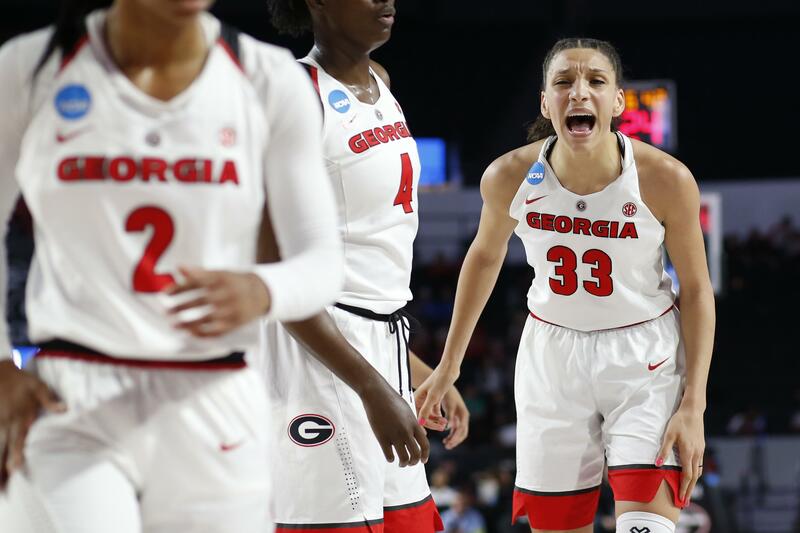 Sat., March 17, 2018, 1:20 p.m.
ATHENS, Ga. – Caliya Robinson had 23 points and 16 rebounds, Mackenzie Engram added 21 points and 10 rebounds, and Georgia held off Mercer 68-63 in the first round of the women’s NCAA Tournament on Saturday. Kahlia Lawrence scored 23 points and KeKe Calloway had 15 for No. 13 seed Mercer (30-3). The Bears had won a school-record 27 straight, the nation’s third-longest active streak. Georgia had the game’s biggest lead at 11 early in the third, but let Mercer pull within one twice in the fourth quarter. After Robinson scored her team’s last field goal with 2:14 remaining, the Lady Bulldogs put Mercer away by hitting seven of their last eight foul shots. Mercer used scrappy perimeter defense, forcing steals and challenging passing lanes on every possession in which Georgia ran a set offense, but the Bears couldn’t make up for a lack of size against Robinson and Georgia, getting outscored 32-8 in the paint. Robinson hit eight of her first nine shots and had 14 points early in the second quarter. Georgia never trailed after Morrision assisted on her layup made it 30-28. There were 11 lead changes and seven ties in the first half. The Lady Bulldogs took a five-point lead, the biggest lead before intermission, on Morrison’s tip-in with 1:07 left in the second. Morrison put back her missed shot on the first possession of the third and then followed with four free throws to make it 43-32, Georgia’s first double-digit lead. Calloway had nine points on 3 for 6 shooting before getting hurt at the 4:50 mark of the second quarter. She returned less than 2 minutes later and didn’t take another shot until her 3 late in the third cut the lead to five. Mercer: The Bears enjoyed the best season in school history, tying Chattanooga’s 2003-04 Southern Conference record for overall wins. Mercer moved into the Associated Press poll late last month, its first ranking since 1980. Lawrence, a senior, leaves as one of the Bears’ career-best player. Calloway’s 3 late in the third set a single-season conference mark with 96 treys. Georgia: The Lady Bulldogs, winners in five of six, showed why they led the Southeastern Conference in field-goal percentage defense, holding Mercer to 31.8 percent. That’s the formula that helped Georgia finish in a tie for second place during the SEC regular season, and the Lady Bulldogs will need a similar effort against Duke. Georgia went 16-15 last year and already has enjoyed the second-best turnaround in school history. Georgia is 0-3 against Duke, the last meeting in the 2005 NCAAs. The Lady Bulldogs seek their 21st trip to the Sweet 16 and first since 2013. Published: March 17, 2018, 1:20 p.m.